Hyperbaric oxygen treatment and Michael Crichton-- the two leading keywords by which people find their way to this blog. Hardly a day passes without one or the other or both listed as "referral" keywords. There was quite a flurry of pieces about him in the past few months, in part because his earliest thrillers, pubished under the name John Lange, had been re-published. Partly also because of the new sequel to JURASSIC PARK, as well as a remake of WESTWORLD. Here's the link to an old interview with him, click to go to that page in this blog. That will lead to some of the other Crichton articles. But the two Michael Crichton-related posts that draw the most relate to articles on the Michael Crichton conspiracy. Why those draw highest, over more informative interviews with him, I have no idea. 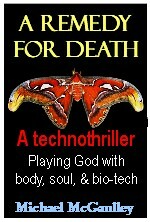 Hyperbaric oxygen therapy plays a key role in the plot-line of my science techno-thriller, A REMEDY FOR DEATH, so I've been posting here links to articles from my older research, as well as newer peices that I run upon. This week (January 6, 2015) the Wall Street Journal ran quite a long article, "Patients take pure oxygen in off-label treatments" link. I had not known that some parents of children with autism have been using HBOT as an off-label treatment. HBOT is also being used for FDA-approved uses including nonhealing wounds and, of course, the orignal use--treating divers with decompression problems. But HBOT is being used experimentally with, in addition to treating autism, sports injuries, strokes, and various athletic injuries. Also, according to that WSJ article, the Defense Department has also studied the use of HBOT to treat post-concussion symptoms. DOD found no significant difference between the test group (who did receive HBO), and a control group, the members of which did not actually receive pure oxygen but were told they did.